Well, Rathyna’s S13 not only had a roached engine, but her transmission had given up the ghost as well. It didn’t shift well, third gear was broken and her clutch was slipping. In our last article we had done a comprehensive rebuild of her car’s tired SR20DET engine and now it was time to go through her gearbox as well. Rathyna had a few transmissions in her junk pile, so we decided to take those all apart and see what we could salvage. Hopefully we could get enough good parts from them to make one good transmission. 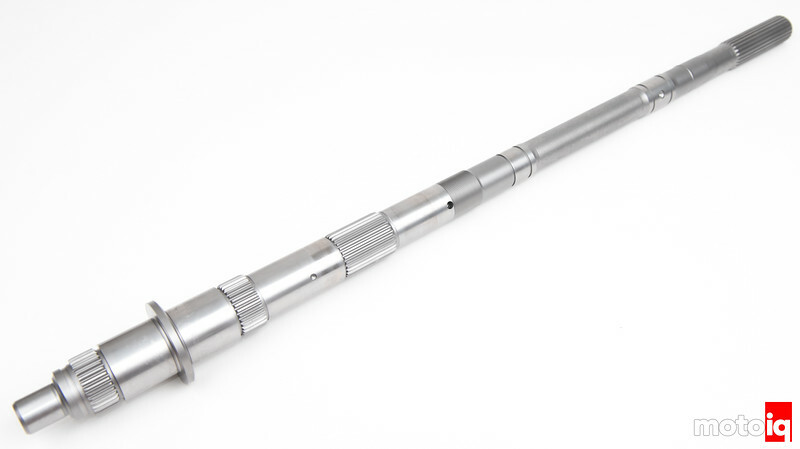 We dug through the parts pile and found a counter shaft in good condition. After cleaning we sent it out to get shotpeened and then WPC treated. 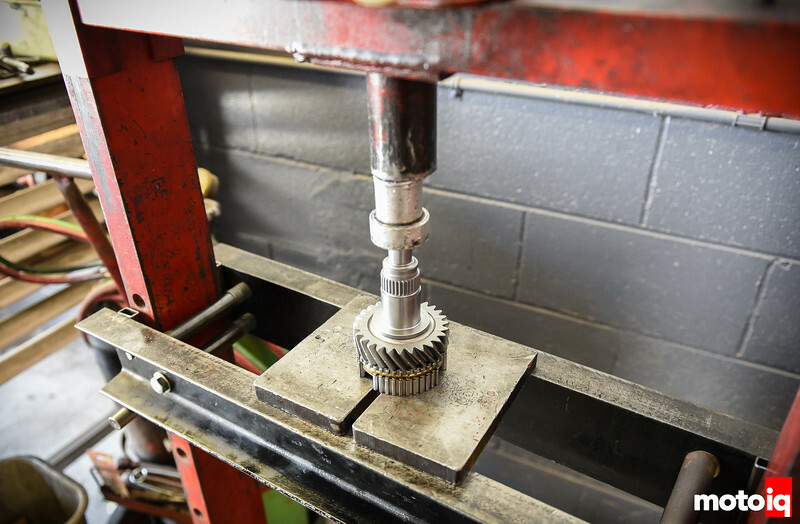 The shotpeening we prescribed was a severe one to improve the gear set’s fatigue strength. 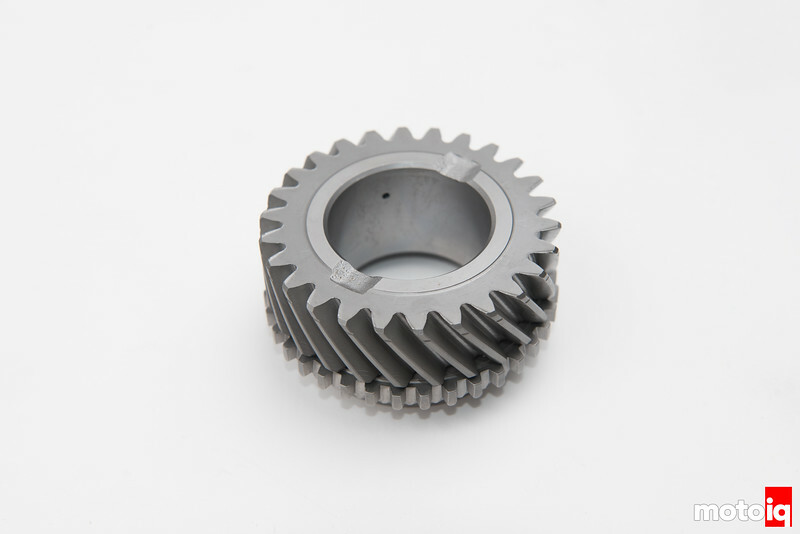 WPC treatment also improves fatigue strength, reduces friction as well and improves gear surface life. 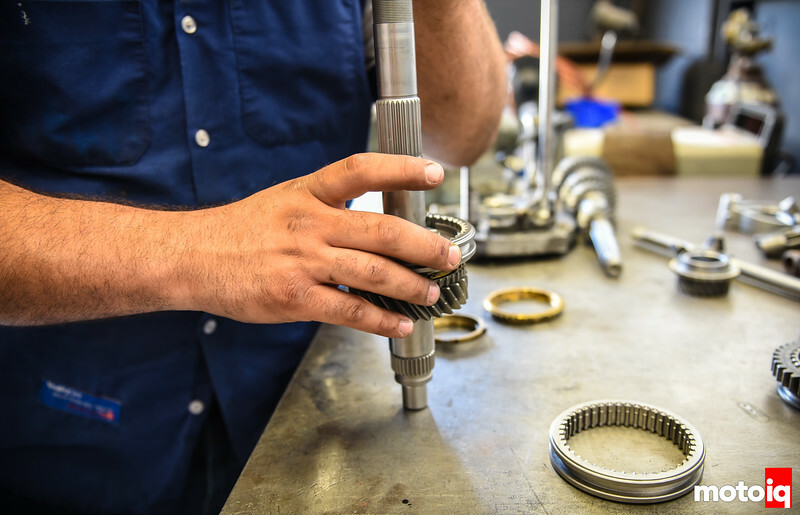 You can read more about transmission prep in this article and we basically followed those steps to improve the durability of the stock transmission. 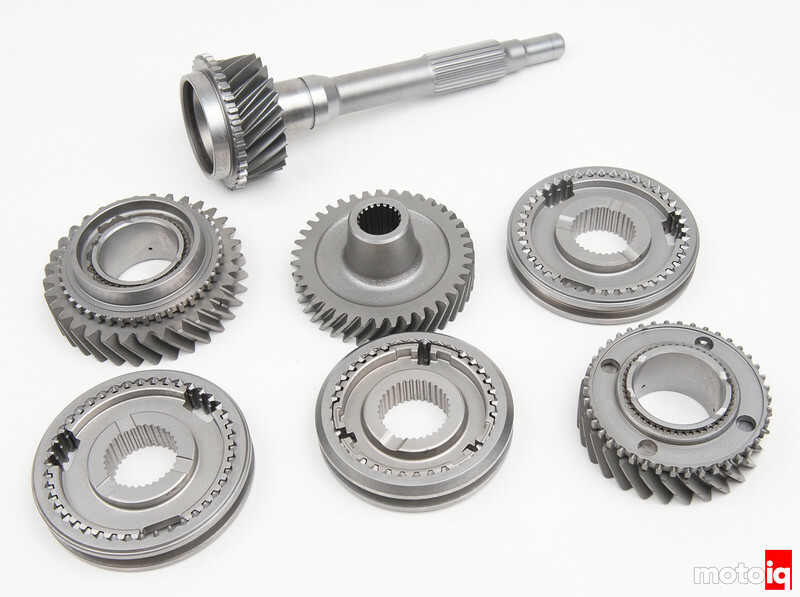 None of our the parts in the pile had a decent third gear. We ended up getting a new one from Fontana Nissan as well as some seals, synchros and bulk rings. We found a nice main shaft and shotpeened and WPC’ed it as well. The lustrous sheen on all the parts is from the WPC processing. Once we got our parts back from WPC, we started to assemble the gear stack on the main shaft, pressing them into place. We used balk rings from the parts pile that were in good shape and got a few new ones from Fontana Nissan. The 3rd gear always goes first on these transmissions. This is caused by the shafts flexing; the 3rd gear pignons get further and further from each other, until there is not enough material in contact and they break. The only way to prevent this is to actually NOT use 3rd gear. 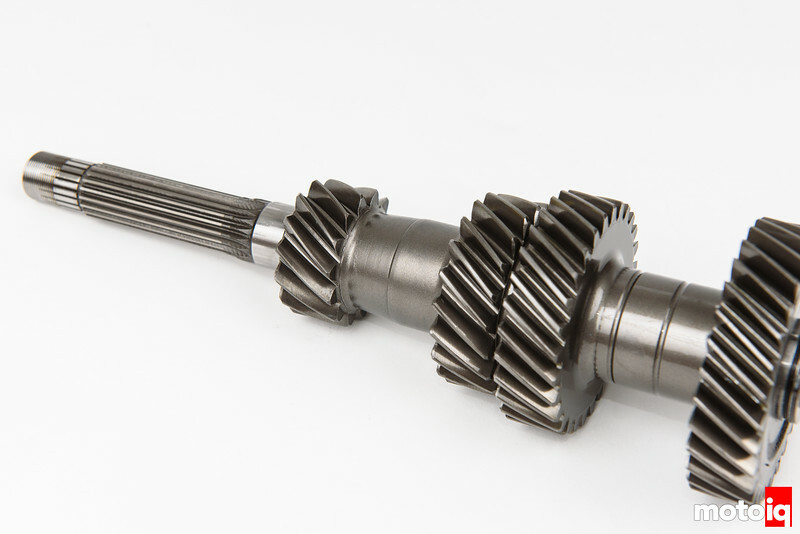 Even OS giken gear sets and input shaft replacement break the same way, once over 350/400 engine HP on a SR. It will break with just sticky road tyres, without LSD. I am actually looking for a (cheap) solution to this too. The CD009 swap looks tike the cheapest one, but it has some drawbacks… mainly a totally useless 1st gear, and not enough main shaft engagement. More expensive solutions include PPG and Elite dogboxes, but i would really like something in between. That is the easiest and cheapest swap to my knowledge too. We are going to hold the power down below 300 in the meanwhile.